If one wanted to rob a store, they might use a gun. But what if they wanted to rob a gun store? Use a pick-up truck. 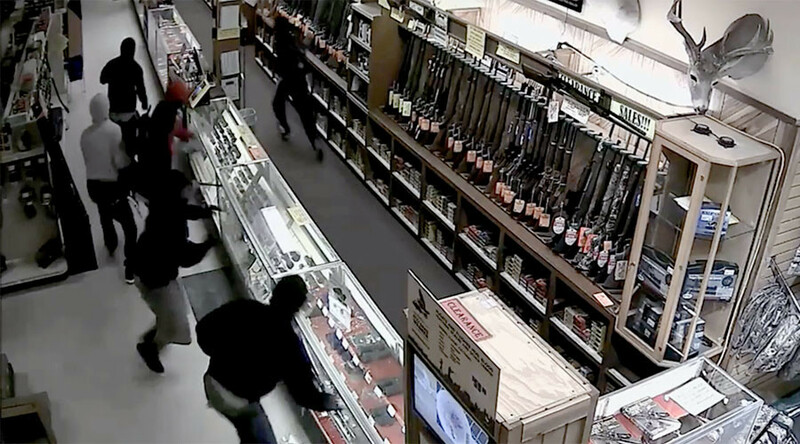 Amazing video of a brazen 4 a.m. robbery in the Texas city of Houston is going viral. In just two minutes, ten suspects in hoodies pulled open the gated entrance with a chain and pick-up truck, scooping up 50 powerful guns including some high-spec automatic weapons. The footage shows one robber smashing open the glass cabinets and two others emptying their haul into bags. The suspects fled in a black SUV before changing vehicles after one block. A spokesman with the Harris County District Attorney's Office said three suspects had been arrested with some of the weapons recovered. Those weapons still out there won’t cause a big increase in the large number of illegal firearms on the streets in border states such as Texas. Between 2006 and 2011, the Bureau of Alcohol, Tobacco, Firearms and Explosives (ATF) allowed weapons to be sold to arms dealers with drug traffickers as clients, in the hopes of tracing them to high-level criminals. Unfortunately, the ATF lost track of hundreds of firearms and some were used in crimes, including the shooting death of US border patrol agent Brian Terry in December 2010.